Runners dress up to celebrate Thanksgiving during the race. 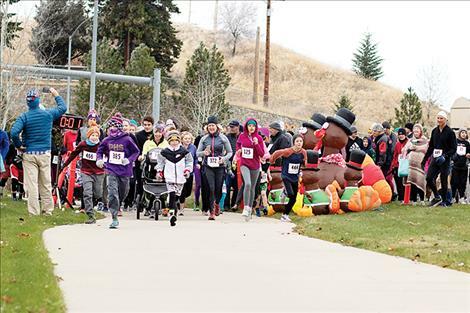 Runners take off at the start of the 5k Turkey Trot on Thanksgiving Day. 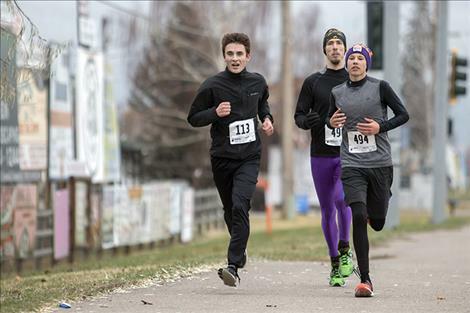 POLSON – How about a little exercise before Thanksgiving dinner? Runners and walkers from all over the Mission Valley came out on Thursday morning to celebrate Thanksgiving and sneak in an early holiday workout during the 11th annual 5K Turkey Trot hosted by Polson Running. At the start of the race, temperatures were brisk. 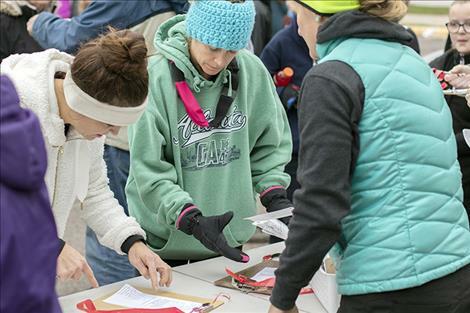 Many of the 150 plus participants, who came out to walk, jog and run the Turkey Trot, dressed in layers, hats and gloves. A few participants dressed up in complete festive costumes and others wore turkey hats. 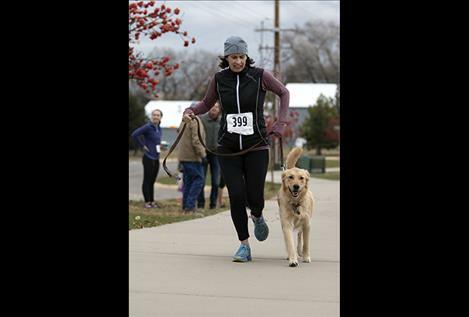 A few people brought their four-legged companions to run beside them. Runners and walkers of all fitness levels took off from the starting line near the intersection of U.S. Highway 93 and State Highway 35. They raced east along State Highway 35 before turning around and running back to the finish line in front of Century 21. Landon Shipley of Polson was the men’s division and overall winner of this year’s event with a time of 19:54. Polson Lady Pirate Bea Frissell was the women’s winner with a time of 20:44. She also won in 2016 and 2017. Lake Farms donated two 50-pound sacks of potatoes for the first finishing female and male runners. 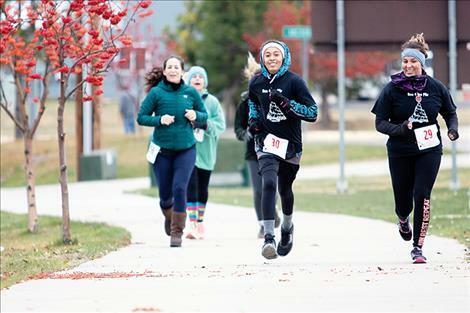 While the race gave runners the opportunity to burn a few calories off before a nice Thanksgiving Day meal, the Turkey Trot is also a fundraiser. The proceeds will benefit the Polson Loaves and Fish Pantry, an organization that aids Mission Valley area families. 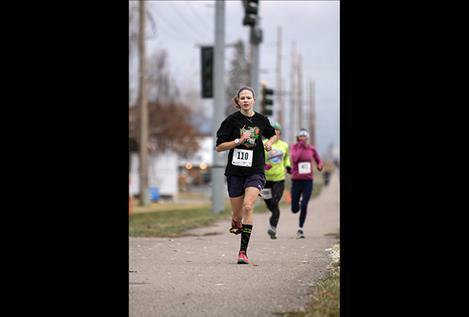 According to race organizers with the Polson Running club, many runners donated canned food along with their entry fees. 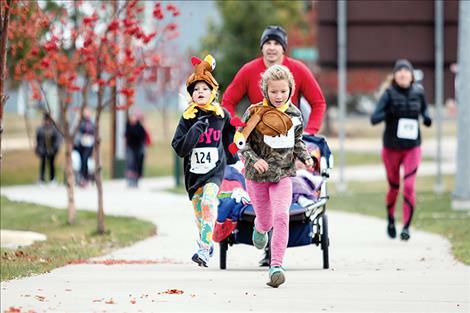 This year, the Turkey Trot raised $860 dollars for the food pantry. The club’s next sponsored race will be the fifth annual Sorry ‘Bout That Half Marathon on Jan. 12. Check out their website www.polsonrunning.com for more information. 2018 Turkey Trot 5K Results: Landon Shipley 19:54, Mason Sloan 19:55, Quentin Bateman 19:55, Josh Krantz 20:24, Bea Frissell 20:44, Jordan Ives 20:47, Jenni Brown 20:51, Caden Howlett 22:02, Ira Brown 22:16, Conner McClure 22:24, Pat Lake 22:33, Adam Lee 23:00, Leo Filardi 23:04, Haley Jacob 23:19 (not exact), Aubry Frissell 23:29, Teague McElwee 23:38, Sean Stewart 23:40, Austin Webster 24:03, Ryan Sloan 24:37, Raina Stene 24:59, Mike Wright 25:03, Katherine Wright 25:03, Reyton Filardi 25:17, Owen McElwee 25:30, Dee McElwee 25:30, Cameron Milton 25:34, BJ Cody 25:45, Chrissy Webb 25:47, Jacob Lake 25:55, Julie Alexander 26:06, Leigh Kenning 26:10, Rob Kenning 26:10, Ashlee Cheff 26:19, Kiel Duckworth 26:20, David Bjorge 26:22, Halle Heninger 26:23, River Shoemake 26:32, Wren Filardi 26:33, Vincent River 26:37, Chris Filardi 26:40, Catherine Filardi 26:45, Sam Dolberry 26:51 and Steve Zabawa 26:52, Maddox Bird 27:08, Morgan Delaney 27:09, Ebenezer Delaney 27:10, Ross Smith 27:45, Davis Smith 27:46, Nico River 27:47, Cory Miland 27:51, Maddilyn Huffine 28:00, Sarah Smith 28:00, Joelle, Traylor 28:20, JT Strang 28:29, Kate Evans 28:29, Lauren Sanders 28:42, Hunter Miland 28:55, Spencer Irwin 29:19, Stephanie Irwin 29:19, Phoebe Norling 29:23, Char Delaney 29:35, Kelby Finley 29:48, McKinze Shutts 30:05, Richard Jeo 30:10, Jan Andrews 30:42, Amy Stiffam 31:02, Roman Sawyer 31:06, Sarah Jacobson 31:23, LeeAnn Muzquiz 31:35, Max Milton 31:46, Rod Stedje 31:50, Nick Pelonsky 31:53, Embree Bird 32:05, Kate Bird 32:05, Jeff Bird 32:06, Jen Shipply 32:11, Andrea Brown 32:11, Jolie Kerrick 32:15, Sandra Fisher 32:30, Jennifer Jacobeon 32:32, Gwyn Scoulle 33:40, Tristan Jeo 34:02, Alison Sloville 34:15, Jody Perez 34:16, Brian Piedalue 34:30, Desere Finley 34:45, Krystal Piedalue 35:00, Elisabeth Bjorge 36:03, Ahna Vitt 36:45, Elizabeth Sawyer 36:51, Jhett McDonald 37:17, Gage Miland 37:17, Judy Miland 37:38, Jaspen Webster 37:38, Allison Grant 37:56, Zachary Scott 38:59, Kadaynce Cout 38:59, Kayla Cout 39:07, Amber Dailey 39:08, Kim Cody 39:10, Sidney Cody 39:12, Landon Brown and 39:59. Quinn Delaney 40:51, Kelsie Delaney 40:59, Marguerite Brenner 41:00, Brooke Bird 41:30, Jeana Bird 41:34, Austin Brown 43:20, Mike Adam 43:40, Brittany Fisher 43:47, Jaei Webb 43:47, Kylei Chartrow 44:44, Melissa Scott 45:20, Nit Davis 45:35, Bill Milton 45:45, Chris McElwee 46:11, Aaron Wilson 46:15, Alexia Wilson 48:21, Gavin Wilson 48:25, Annie Carr 48:42, Cami Eversen 49:39, Amber Dailey 49:40, Bo Dailey 49:43, Steve Reed 49:43, Danna Reed 49:43, Roger Smith 49:43, Linda Davis 50:05, Jill Davis 50:05, Kelsey Wright 51:13, Lauren McCrea 52:33, Isaah McCrea 52:36, Jack Huffine 53:11, Shyloh Huffine 53:33, Laure Torgerson 53:34, Frank Cirz 54:38, Bette Duckworth 54:40, Mary Cirz 54:41, Keeley Momberg 55:24, Felicia Blandor 55:25, Brittany Matt 55:26, Bateman Batie 56:06, Emily Hall 56:08, Steve Wright 1:00:25, Kathy Wright 1:00:54, Claire Lanier 1:01:34 and Catherine Lanier 1:01:36.